It’s hard to keep everyone focused on work this time of year. Between Thanksgiving and the New Year there are countless distractions. As a team leader, you can leverage the holidays to have a little fun and strengthen your team spirit. Best of all, it doesn’t have to break your budget (I know most team leaders are paying out of pocket for these types of things!). Over the next few weeks, I’ll share some easy and inexpensive team activities to help do just that. About four to five leaves per team member, copied on different color paper, if available. (If not, no worries!) The leaves should be big enough to write a couple sentences on, so about four to a page. Follow this link for many options to choose from. Send an email to the team letting them know that in the spirit of Thanksgiving, we are going to create a team gratitude garland. Ask each team member to take at least three of the leaves (you might want to just place three on each desk & have extras at your desk). Your team members should use the markers to write something on each leaf they are thankful for at work. It could be something special a team member has done, a special quality about the team, a great customer, or something meaningful that happened earlier in the year. After each person writes their leaves, they should use the clothespins or paper clips to attach the leaves on the yarn. Then, watch the garland fill in! Be sure to spend some time reading what is written on the leaves. As individual people or actions are written about, call attention to them. Quietly nudge people to read what their teammates wrote. Take the time to write some leaves yourself, perhaps one for each person on your team. Let your team members know how heartwarming it is to you to see what they are thankful for. Let the garland be a conversation starter! If you don’t have time to do this in the next couple days, consider the same activity using “snowballs” (circles on white paper) and fill in a large snowman shape on a nearby wall. The point is to have some seasonal fun and build each other up. 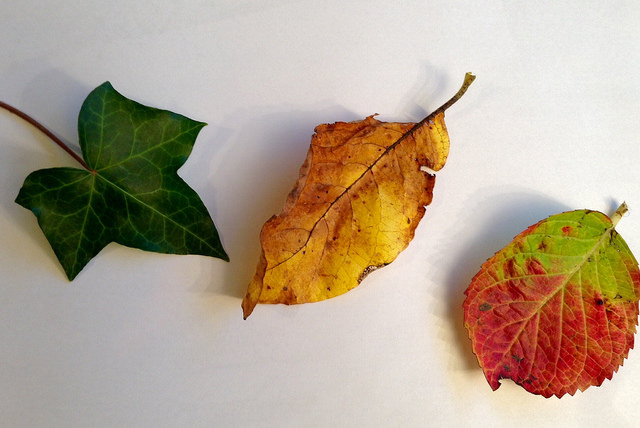 Photo credit: “Autumn Leaves” by Smabs Sputzer used with Creative Commons license.